AERO Specialties is proud to be an authorized distributor of TLD TMX-150 and 250 aircraft pushback and tow tractors. 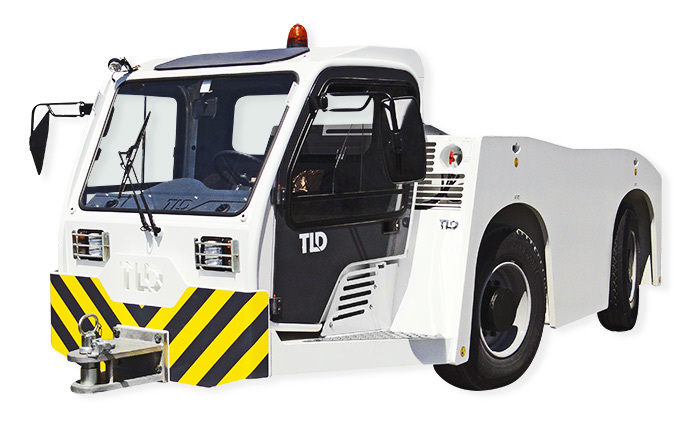 The TLD TMX series aircraft tractors are designed to perform pushback and towing operations on narrow, medium and widebody aircraft. TLD TMX tractors have the ability to move aircraft up to the Boeing 787 and Airbus A350, depending on the specified weight configuration. TMX tractors feature All Wheel Drive and All Wheel Steering capabilities to confidently move large aircraft in all weather conditions. The TMX-150 and 250 boast turbocharged 4-cylinder diesel engines that are Tier and CARB compliant. This equates to regulatory-friendly power generation. TMX tractors freature a compact and ergonomic design, constructed and tested to be safe and comfortable, yet rugged enough to stand up to the most demanding conditions. Operator visibility is unparalleled. The TMX-250 All Wheel Drive and All Wheel Steer aircraft tow tractor is designed to perform pushback and towing operations on narrow, medium and widebody aircraft in all weather conditions. Its ergonomic design provides agility and visibility. TLD’s high standards of build and component quality make the TMX-250 a durable and reliable tractor. Brake (Parking): Immersed wet disc brake on rear axle, spring applied hydraulically released. Hydraulic System: One hydraulic pump flanged on transmission PTO for power steering and braking. All TLD TMX series aircraft tractors are covered by an extensive 30-month or 2000/3000 hour warranty. TLD offers 24/7 tech support and on-site service. In addition, AERO Specialties offers distributor warranty support.